Are the alleged apparitions of Mary in Medjugorje a visitation from heaven, or the sinister projection of a collective guilty conscience? There was another woman who lived in a house and something kept constantly knocking on her window. Later on, this very same woman got an apartment way up on the sixth floor and again something kept tapping on her window. I questioned the Gospa about what it was. She replied that the souls in Purgatory were doing so because she has forgotten to pray for them and they are demanding her prayers. uring the late afternoon of Wednesday June 25, 1997, a nondescript European rental car pulled off a narrow paved road at the far eastern end of the Brontjo plateau not far from the Neredva River in Bosnia-Herzegovina onto an even narrower unpaved road that was no more than two tracks of red dust punctuated periodically by football-sized limestone rocks. The car proceeded slowly, perhaps because the track was so narrow. The thorn bushes, which encroached on the track, scratching occasionally against the car's roof like the fingernails of an ill-mannered child on a blackboard, seemed to grow to about two meters in height and then stop as if that were all the available nourishment and water allowed. But the car proceeded slowly for another reason; both men in the car were looking for something. Both men were looking for the site of an atrocity committed against civilians in the early years of World War II. They were looking for something buried in the ground, something which had been buried over 50 years before, then exhumed and memorialized, then desecrated and abandoned. But the gravesite, no matter how significant, especially in the light of atrocities which got committed even more recently, had symbolic value as well. The pit at Surmanci symbolized the dead hand of the past resting silently on the tiller of the present, steering a course of events which seem random when viewed in ignorance of the past, but only so in light of that ignorance. Both men's lives had been irrevocably changed by events which had taken place on the other side of the hill which now loomed to their west. Both men had been here before. Both of them were looking for something they had missed the first time around. The pit at Surmanci symbolized the dead hand of the past resting silently on the tiller of the present. The driver of the rental car was a wealthy California businessman in his sixties. His face was tanned; his hair was silver gray and neatly combed and he was dressed as if he had just wandered off a golf course. Sitting next to him on the passenger side was a younger man, roughly 20 years his junior, with darker, longer hair, the author of this account, and a journalist by trade who had written a book about this region some nine years before. I had made contact with Phil Kronzer, the driver of the car, in April of 1997, when he saw my name as one of a list of speakers at an anti-Call to Action Conference to be held in Lincoln, Nebraska in May. Call to Action was a Catholic group, comprised mostly of liberal clergy or ex-clergy founded in 1976 as a way of updating or subverting - depending on your point of view - the Catholic Church in the United States. One person who took the latter position was Bishop Fabian Bruskewitz, ordinary of Lincoln, who made national news in the spring of 1995 when he threatened to excommunicate anyone who belonged to Call to Action in his diocese. Phil Kronzer, who picked me up at the airport in Lincoln, was convinced that Call to Action had destroyed his marriage and was in the process of destroying his business empire and came to me as an expert to help him out. Just where my field of expertise lay, however, was not immediately apparent. The more he talked the more it became apparent to me that he was barking up the wrong tree. The source of Phil's marital problems was not Call to Action or radical feminism (although he made a plausible case for their connection in California); the source of Phil's problems was Medjugorje, the village we had just left, the site, since June of 1981, of alleged apparitions of the Blessed Virgin Mary and now the focus of a booming pilgrimage industry that was on hard times but recovering because the civil war that brought about the demise of Yugoslavia and its tourist industry during the four year period from 1991 to 1995 was now over. Phil and his wife Ardie had made their first pilgrimage to Medjugorje in the summer of 1987, and, as a result of that trip, became involved in Medjugorje prayer groups in California and then in the burgeoning and increasingly lucrative Marian conference industry, which took off in 1991 when the civil war put an end to tourism and left the Marian enthusiasts in the United States all dressed up with no place to go. In early 1993, according to the account Phil sent me, Ardie Kronzer met a fellow Medjugorje enthusiast by the name of Marcia Smith, a mysterious lady who frequented charismatic circles in San Francisco and had even been a lector at the pope's mass at Candlestick Park in 1986. Through Marcia Smith, Ardie became introduced to the tight circle of con men and felons who dominated the Medjugorje industry in the United States during the early 1990s. Through Smith, Ardie met Theresa Lopez, phony seer from Denver, and her handler at the time, Bishop Paolo Hnilica, of Rome and Slovakia, who had been convicted of trafficking in stolen goods in Rome. The good bishop had been wiretapped by the Italian police in conversation with underworld kingpin Flavio Carboni, whose notoriety became international when he was arrested in connection with the disappearance and death of Roberto Calvi, then president of the Banco Ambrosiano, whose failure in the early ë80s was the biggest financial scandal to hit Rome and the Vatican in the post-World War II era. Bishop Hnilica was interested in buying Roberto Calvi's briefcase, which had disappeared, reportedly full of Swiss bank account numbers, around the same time Calvi was found dangling from Blackfriar's bridge in London on June 18, 1982. Gradually, the Smith-Lopez-Hnilica group became aware of the Kronzer family's financial resources and drew Ardie into a scheme which began with a series of retreats, during which she was told that she and her money were to play a crucial role in the conversion of Russia, and ended when Ardie moved out of her home in late June of 1994 after attending a Medjugorje conference at Notre Dame University. At that conference, Ardie and Marcia knelt down before Bishop Hnilica and, in a ritual that was bizarre even by Medjugorje conference standards, had offered up to him the 12 bay area Mir groups, over which he was to preside as a way of bringing unity to a Medjugorje movement whose main characteristic as of the early ë90s had become battling over money from easily bilked pilgrims who had no place to go after the civil war broke out in Yugoslavia. What this had to do with Dr. Jones, the passenger, would have been obvious to anyone who was familiar with these circles. In September and October 1988 I had published a series of articles on Medjugorje, later published in book form under the title Medjugorje: the Untold Story, which criticized the "apparitions" as a hoax and provided the world with one of the few sources on the phenomenon which wasn't written to serve the financial interests of tour guides, conference promoters, or rebellious Franciscans from Herzegovina. The revelations prompted a decline in the circulation of Fidelity magazine, where they first appeared, and in the esteem with which the author was held in conservative, Marian circles in subsequent years. One perceptive reader wrote to Jones years later and at least partially in response to his stand on Medjugorje described him as "a one-legged man in an a**-kicking contest," a description which Jones himself saw as not without justification. After their initial meeting in Lincoln, Nebraska, Jones joined Kronzer as the latter traveled back and forth across the country tracking down leads. One trip led to Reno, Nevada, where both men met the husband of a seer, or better, the seer's ex-husband. Jeff Lopez met Tonie Alcorn in April of 1987 as the result of an affair they had had when both of them were working at Wendy's in Denver, Colorado. In March of '91 Tonie, who was then known as Theresa Lopez, went to Medjugorje shortly after pleading nolo contendere to a charge of writing bad checks. 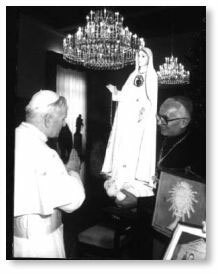 By November of 1991 she was having her own apparitions and drawing thousands of people to the Cabrini Shrine near Denver, Colorado. Two years later, Theresa left her husband to become a full-time seer. The last time they were together Theresa told Jeff, "if I get involved with this I can be somebody." Phil Kronzer had lost his wife to Medjugorje around the same time Jeff Lopez had lost his, which is to say, over the winter of 93-94. Both of these domestic tragedies began with Medjugorje; just where they were going to end was not clear. When Jones got back to his hotel room in Reno, he got a call from a man in England warning him that if he went back to Bosnia, the Franciscans were going to have him killed. Proponents of the "apparition" like to talk about its fruits when they become uncomfortable with the behavior of the seers and their Franciscan handlers. Over the ten years since he had become involved in investigating Medjugorje, Jones had come up with his own list of fruits. The death threat he had just received in Reno was the beginning of a long list of bad things that had happened to the world since the Queen of Peace arrived in Yugoslavia in 1981. In addition to the broken families there were the broken vows, the pregnant nuns, the poor people bilked of their money, the division in the Church, the de facto schism, leading most recently to illicit confirmations in Capljina, the kidnapping of the local bishop, the ethnic cleansing, and, most dramatically, the worst fighting in Europe since World War II. All in all it was an impressive amount of malfeasance coming, as it did, from a group of people whose stated intention was prayer and following the instructions of the Blessed Mother. It was Bishop Pavao Zanic, then ordinary of Mostar, who wrote to Rene Laurentin, then Medjogorje's major promoter, and predicted that "one can look forward to a religious war here." Zanic, who predicted war in the mid-'80s, was more prescient than Our Lady of Medjugorje, who was saying at the time that she was the Queen of Peace, and had come to bring peace to Yugoslavia and the world. Her promoters were saying that one of the signs of the authenticity of her messages was the fact that ethnic groups were living in peace in Yugoslavia. The death threat (Jones) had just received in Reno was the beginning of a long list of bad things that had happened to the world since the Queen of Peace arrived in Yugoslavia in 1981. Then came the bloody break-up of Yugoslavia amid a vicious war, which is perhaps another reason why both men peered so intently at the rusty red and white track in front of them as their car inched its way further into the scrubby thorn bushes. 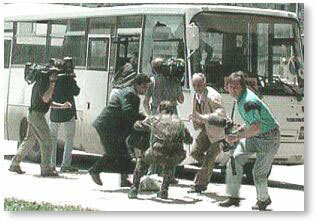 One year earlier three journalists had died when their car had driven over a land mine on the outskirts of Mostar. As the car bumped its way slowly down the two tire-track path, Jones found himself remembering the incident and wondering just where the outskirts of Mostar began and ended. At one point a farm appeared, the farmhouse, outbuildings and fences all assembled out of the building material most readily at hand, namely, the chunks of limestone that littered the landscape. A toothless grandmother, clothed in the traditional black skirt and sweater favored by peasants of the region, raised a hand in either greeting or warning as they passed. The object of their search was a geological formation peculiar to the area known as a "jama," translated roughly from the Croatian to mean pit or ravine. When the rains come to the Brontjo plateau, as they infrequently do, they percolate through the porous earth right to the limestone karst underneath where they erode caverns that lead directly to the Neredva river, which takes its luminous shade of blue-green from its journey through the limestone deposits. During the spring and early summer of 1941, the Ustasha, a Croatian fascist group which means "insurgent," had created a short-lived but ferocious independent Croatian state by allying themselves with the Nazis. Local Ustashe did a little informal geological research of their own in the area between Medjugorje and the Neredva River, taking note of the largest jamas, the ones most suitable to their future purpose. 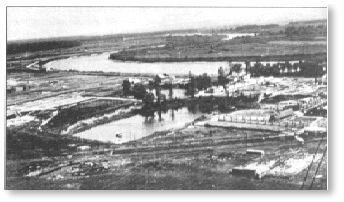 Then in June of 1941 roughly two months after the creation of the NDH on April 10, armed Ustasha functionaries showed up at the predominantly Serbian village of Prebilovci on the eastern side of the Neredva and other Serb enclaves and announced to the villagers that they were all going to be deported to Belgrade. The Serbs were told they were going to be reunited with the Serbian fatherland, a prospect that took the edge off their anger and anxiety. So the Serbs showed up in their best clothes as they marched off to the train station, to become one more dislocated group in a Europe that seemed full of dislocation and people who went off in trains and never came back. The Serbs of Prebilovci were herded together with other Serbs from the western part of Herzegovina and eventually six carloads of them were sent off on a train that was supposedly to take them back to Belgrade. The train ride was much shorter than expected, at least as expected by the Serb passengers, who were ordered out of the six cars they occupied at a town called Surmanci, on the west bank of the Neredva, and marched off into the hills never to return. Roughly three months later, Bishop Zanic's predecessor, Aloysije Misic, ordinary of Mostar, the ornate Ottoman town a few train stations upstream from Surmanci, wrote to Cardinal Stepinac, primate of the once and future Yugoslavia, a man who would end up in prison at the hands of Tito's revolutionary justice, and told him of disquieting reports of atrocities perpetrated against the Serbs in his diocese. "Men are captured like animals," Misic wrote, "they are slaughtered, murdered; living men are thrown off cliffs....From Mostar and from Capljina a train took six carloads of mothers, young girls, and children...to Surmanci....They were led up the mountains and...thrown alive off the precipices....In...Mostar itself they have been found by the hundreds, taken in wagons outside the town and then shot down like animals." Eventually around 600 Serbs, including priests, women, and children, were thrown into the pit above Surmanci and then, after throwing hand grenades in on top of them, the Ustashe thugs buried them, most probably still alive. Parris writes: "At Prebilovci and Surmanci, in Herzegovina, 559 Serbs, all of them old men, women and children, were led to a deep crevice called Golubinka, massacred and then thrown into space. And to do the job more thoroughly, hand grenades were hurled down upon the dying bodies." Parris then goes on to list the names of the perpetrators, a list which includes names like Ostojic and Ivankovic, names which are common enough in the area - names, in fact, of people still living in Medjugorje. Brian Hall wonders in his book on the break-up of Yugoslavia whether the Ostojic he stayed with while in Medjugorje was the Ostojic accused of the Surmanci atrocity. The history of Yugoslavia, one quickly learns, is not something for those interested in a quick read. The more one delves into the issue, the more one comes away with the impression that there is no such thing as an impartial history of the region, certainly not during the period surrounding World War II. Parris, who is no exception to this rule, also claims that two priests took part in the massacre at Surmanci, one of whom also has a familiar name. Marko Zovko, it turns out, was a priest, but not a Franciscan like the more famous Jozo Zovko, the man who, in many ways, created the Medjugorje apparitions. Marko Zovko was the secretary to Bishop Cule, Misic's successor. I learn this from the current Bishop of Mostar, Ratko Peric, who traces the Parris citation to Viktor Novak's book Magnum Crimen, which was written to accompany Tito's 1946 show trials. The purpose of both the book and the trials was to implicate the Church in the crimes of the Ustashe. As a result, Novak's book has to be viewed with caution. This is the verdict not only of the current bishop of Mostar, but also Serb scholars as well. Miro Todorovich, editor of Measure, said no one, referring to the Serbs he knew, was willing to put his hand in the fire over Novak's book. Srdja Trifkovic, also a Serb, who now teaches at Rose Hill College, an orthodox college in South Carolina, sees Magnum Crimen as "an attack on the role of the Catholic Church in Croatia, which Novak saw as the moving spirit behind the Ustasa atrocities." When Serb nationalism reawoke in 1988, a reissue of Magnum Crimen was a huge best-seller in Belgrade despite the book's high price. Bogdan Krizman called it, nonetheless, "a prominent Freemason's settling of scores with the clericals." Trifkovic has similarly unflattering things to say about Edmund Parris, claiming that his book Genocide in Satellite Croatia was ghost-written by Branko Miljus, a Serb emigre publicist, and dismisses Parris otherwise as the author of "several theological tracts critical of Roman Catholicism." The religious situation is complicated by the fact that the Catholic Church in Herzegovina is split between two factions, one loyal to the bishop of Mostar and one loyal to the Franciscans, who have been in open rebellion against both the local ordinary and the Franciscan general in Rome since 1976 when they refused to hand over a number of parishes which they administered to the Bishop of Mostar's jurisdiction. Like his predecessors Misic and Zanic, Bishop Peric has had to deal with the rabidly nationalistic Herzegovinian Franciscans, the driving force behind the Medjugorje apparitions and collaborators in Ustashe atrocities during World War II. In January of 1997, roughly three months before I met with Peric at the chancery office in Mostar, Peric granted an interview to Yves Chiron in the French magazine Present, in which he admitted that Medjugorje was plagued with ecclesial disorders, which included Franciscans ministering at Medjugorje with no canonical mission; religious communities established without his permission, buildings erected without ecclesial approval, and the fact that parishes continued to organize pilgrimages to a place where it had been determined there had been no apparitions. "Medjugorje," Peric concluded, "does not promote peace and unity but creates confusion and division, and not simply in its own diocese." (Present, 25 January 1997). Peric found out first-hand just how bellicose the "Queen of Peace" and her supporters can be. In April of 1995 the bishop was attacked by a mob in his chancery, and his pectoral cross was ripped from his person. He was then beaten up, forced into a waiting car and driven to an illicit chapel run by the Medjugorje Franciscans and held hostage for 10 hours. It was only when the mayor of Mostar showed up with UN troops that the bishop was released. The Franciscan-orchestrated attacks on the Bishop of Mostar are one indication that some things never change in this story. A drive through Medjugorje indicates the exact opposite. Perhaps the best way of resolving the conflict is to say that the more things change, the more they remain the same. The Catholic Church did end up condemning Medjugorje in 1991, but St. James Church continued to attract pilgrims. Even the war didn't stop that completely. The statement of condemnation issued by the Yugoslavian Bishops' Conference in Zadar in April 1991 was similarly fraught with ambivalence. It stated that there was nothing supernatural about the occurrences at Medjugorje, but then went on to add that the pilgrims should be taken care of, which prompted the Franciscans to claim that Medjugorje had been officially recognized as a shrine for pilgrims without specifying just why anyone should go there since officially nothing supernatural had ever happened there. Pilgrims to what, one is tempted to ask. Eventually, Rome stepped in and said, in effect, no, Medjugorje had not been recognized as a shrine. Some indication of what Medjugorje was like during the dawn of its heyday, there is Mary Craig's book Spark from Heaven, based on Craig's trip to Medjugorje in September of 1986 as part of the crew which made the Everyman film, which eventually ended up getting shown on the BBC and spread far beyond as a video. "Never," Craig tells us in no uncertain terms, "would the children accept money from well-wishers." The quote crosses my mind after I almost get run over by Ivan Dragicevic, a seer who is in a hurry to leave the church parking lot in his late model, gray BMW. The Franciscans may still hate the local bishop, but the lives of the seers have certainly changed dramatically since the mid-'80s when Ivan used to stand on a pile of rocks and address the pilgrims not far from his home at the far end of Bijakovici, the hamlet where all of the children were born and the site of the first apparition. Ivan is a lot heavier than he was in 1986, which indicates either that he is not following the three-day-a-week bread and water fast that he prescribed for the rest of the world (allegedly at the Blessed Mother's request) or that he is in urgent need of diuretics to alleviate water retention. In addition to being the proud owner of a BMW, Ivan also has a German-looking mansion now across from where he used to live and on pretty much the same spot where he used to address credulous pilgrims telling them that the Blessed Mother wanted them to spend two hours saying the rosary. In addition to all that, Ivan is also now married, to Loreen Murphy, the former Miss Massachusetts. All in all this peasant boy from the poorest section of a poor country has done well for himself. His might be an inspiring success story were it not for the fact that his ostentatious lifestyle clashed so outrageously with the asceticism one associates with seers, or used to at any rate. Sister Lucia, the seer at Fatima, became a cloistered nun and disappeared from the world's view and only published a memoir of her encounter with the virgin at the request of her religious superior. Her two fellow seers died horrible painful deaths in childhood. On the afternoon of June 25, 1997, Ivan spends his time mingling with the crowds outside St. James Church. His hair is thinner now; his gut hangs over the waistband of his expensive suit, but he still has the same false teeth, and the same aloofness if the doesn't know you and the same ingratiating obsequiousness if he does and thinks you can be of benefit to him. St. James Church has undergone dramatic transformation as well. What used to be the muddy area surrounding it is now paved and decorated with statues. What used to be pasture and farmland behind it has now become a gravel parking lot, whose focal point is a hideous tent-like pavilion behind the church, which dwarfs the church itself, much as the apparitions and what they stand for have come to dwarf the Catholic parish which spawned them. Like the apparitions, the pavilion got the Franciscans in deeper trouble with the bishop for building it without permission, As I watch Ivan work the crowd, I remember the way people used to talk about the seers and their lives. Mary Craig wrote in 1986 that "it would be preposterous to say they've been telling lies for over five years, making fools of the whole world. They are too simple, too guileless, too unsophisticated for that. And anyway, why would they? For money? No, they resent being offered money. Fame? No, they shun publicity. A better life? Oh, theirs would be a miserable life indeed if they were living a lie. People have been besieging them, pestering them in their own homes for five years, leaving them no peace." No peace, did she say? The words take on increasing irony with time. Medjugorje, it turns out, did not bring peace; it was an interlude between two wars. No peace, did she say? The words take on increasing irony with time. Medjugorje, it turns out, did not bring peace; it was an interlude between two wars. In fact, it was an incident that grew out of one war and led to another. This is one of the things that becomes apparent the second time around as Phil and I bump down the dusty track that leads to the hole in the ground where 600 Serbs were murdered almost to the day forty years before the apparitions began. Ten years ago one heard rumors of the atrocity, but that all seemed part of the remote past then. One of the lessons one learns in this part of the world is that the past is never remote. It is always just beneath the surface ready to emerge like a corpse from a shallow grave after a heavy rain. The corpses of Surmanci did, in fact, emerge from the ground in 1989 when a delegation of Serbs arrived at the jama and broke through the concrete lid the Communists had fastened over it and exhumed the Serb remains and took them in ceremonial procession, in little coffins draped with Serbian banners back across the river to be re-interred in Prebilovci, from whence they had departed. The disinterment took place in June, as does just about everything of significance in the Balkans. Politics didn't seem important back in 1988 when I had been here last. Politics never seemed important to Phil on any of the several trips he had made. But then the war broke out, and then he lost his wife, and suddenly both of us had the sense that we had missed something the first time around, something a careful search might reveal this time. To link the jama with Surmanci, the village which gives it its name, is deceptive in a way. Surmanci is village on the rail line that follows the Neredva river from Metkovic to Mostar. Surmanci is on the flood plain but surrounded by the cliffs which mark the beginning of the Brontjo plateau. It is from these cliffs that the Serbs were thrown to their death; it is on the plateau that ends abruptly with the cliffs over the Neredva that the village of Medjugorje is located. The drive out of Medjugorje is deceptive in this regard as well because the distance traveled is not in a straight line. The road from the place of the apparitions in Bijakovici to the jama above Surmanci is in effect a large U-turn around the hill called Crnica, now known as apparition hill. The drive is in effect around the base of Crnica. You begin the drive on the apparition side of Crnica and you end up on the atrocity side of the same hill when you get to the jama, which prompts a thought: were the atrocity and the apparition just two sides of the same coin?. What strikes you even more than the spatial propinquity of atrocity and apparition is the eerie coincidence of dates. Just about everything of significance in Balkan history seems to happen in June. The defining moment of Serbian history, the Battle of Kosovo Pole took place on June 28, 1389. The assassination of Archduke Ferdinand in Sarajevo, the event that led to the outbreak of World War I, occurred on June 28, 1914, as sort of weird symbolic commemoration of the Battle of Kosovo Pole. The Croatians declared their independence from Yugoslavia on June 25, 1991, which corresponded to the day to the tenth anniversary of the apparitions of Medjugorje, which took place on the fortieth anniversary of the Massacre at Surmanci. Roger and I had seen, in the Orthodox Monastery at Zitomislic, a plaque that froze our blood. It commemorated the day, forty years earlier, 21st June 1941, when seven of the monks, from the Father Superior down to the youngest novice, were buried alive by the Ustase in the pit at Surmanci. Three days after that plaque had gone up, the apparitions started a few miles away in Medjugorje. That weeping woman, could there be a connection? Was this why Medjugorje had been chosen? Had those six children absorbed the hopes, desires, fears and guilts of a suffering people? The connection between Surmanci and Medjugorje, both from the point of view of place and time, seems too obvious to ignore, although Craig goes on to do just that in Spark from Heaven, which ends up being one more instance of promotional literature - a bit ambivalent, better written perhaps, but in the end another piece of advertisement for the ultimate benefit of the airlines, the travel agents, the Franciscans and the "seers." Ever since the Catholic Church decided that nothing supernatural was going on in Medjugorje, the question of just what the "seers" were seeing became more problematic. Bishop Zanic, who had the advantage of talking to the seers firsthand in their native language, felt that the apparitions of Medjugorje were a joke that got out of hand. The two girls who started the whole thing told him they had gone up the hill to tend sheep. When Zanic reminded one of them, Ivanka Ivankovic, that it was a sin to tell a lie, she almost immediately recanted and said they went up to have a smoke. Just what they were smoking at the time was a source of contention as well. Mirjana Dragicevic, the other original seer, was known as a big city "Pankerica," their word for punk, and her reputation in the village was associated with the big city, Sarajevo, and drugs. The charges never got resolved one way or the other. The children were never tested to see if they had taken drugs and in the end the accusation of drug use got dismissed as heavy-handed communist propaganda of the sort this sort of person would mount against saints. But the "seers" are far from being declared saints by the same Church which declared them liars. So the questions remain. What exactly did they see on that day in June in 1981? Or did they see anything at all? In late October 1989, Ivan Dragicevic, the Medjugorje "seer," was a long way from home. He was in San Francisco in fact, and having survived the biggest earthquake in recent memory on the day of his arrival, he was standing in the back yard of a Croatian Emigre by the name of Joe Tolaich, having a cigarette. Joe Tolaich was part of the Croatian Diaspora living in the bay area. He had grown up in Metkovic, a few kilometers down the Neredva from Medjugorje and had in fact been one of the first people to arrive in Medjugorje as pilgrims during the summer of 1981. Joe's attitude toward the Blessed Mother had a distinctly practical bent. Faced with the prospect of having a seer who had daily contact with the Blessed Mother in his own home, Joe asked Ivan if the Virgin Mary might divulge, during one of her visits, her favorite six numbers, so that Joe could put them to good use in the state lottery. Perhaps Joe had become skeptical because of Ivan's lifestyle. Whatever the reason, he never got an answer to his question, which prompted him to ask Ivan on that evening while he was having a cigarette in his back yard, whether Ivan was really seeing the blessed Mother. Ivan's answer was something less than reassuring to the pious. "Joe," Ivan replied after taking a drag on his cigarette, "I'm seeing something." Evidence from other sources close to the seers corroborates Ivan's testimony. Mirjana once described a vision in which she saw the Virgin Mary appear, only to be replaced by a second virgin, who told her in a different voice, "You see even the devil can come dressed as me." In a second encounter, Mirjana saw a beautiful young man standing in the doorway to her room who told her that even the devil can come as a beautiful being. The possibility that the seers were seeing a spiritual entity which was not the Blessed Mother was mentioned explicitly the day before our trip to Surmanci by a priest who has been associated with the apparitions for over ten years and during that period has gone from an being avid believer and promoter to a confirmed skeptic. After years of hearing confessions and assembling a library of new age material from penitents, it became clear to him that Medjugorje was a major stop on the New Age circuit. Before long, the Blessed Virgin even started talking like a new age guru. The first message to issue from the lips of "Our Lady of Medjugorje" after the bishops' condemnation was that her devotees should turn "negatives into positives," a turn of phrase which struck this priest at the time as totally unbiblical, a feeling which received dramatic confirmation when he found exactly the same phrase coming from the lips of New Age guru, Sanaya Roman, "Channel for Orin." "Or," the priest remembered, was the Hebrew word for light. The Latin word is Lux, whose genitive is lucis, which is the root of the name light-bearer, or Lucifer. The passage about changing negatives into positives, which Marija Pavlovic cited verbatim as the first message from the Gospa after the bishops' declaration of April 1991, is the title of Chapter Five of Sanaya Roman's book, Living with Joy: Keys to Personal Power and Spiritual Transformation (Tiburon, CA: H. J. Kramer, 1986)..
Somewhere between the hypothesis that Medjugorje was a joke that got out of hand and the theory that the kids are talking to demons, I begin to descry a third possibility, based on its geographical and historical context and their relationship to the massacres at Surmanci just on the other side of apparition hill. The "seers" saw a ghost. Ghosts, to begin with, are psychological, whereas demons are ontological. Demons are actual beings; they are pure spirits, or angels who have chosen to rebel against God and live in a state of eternal separation from Him. Their only consolation comes from making other rational creatures, who were created to share happiness with God, share their misery instead. Ghosts, on the other hand, are a function of the mind which beholds them. They are traditionally seen as the souls of men who have not gone to hell but rather to purgatory, from whence they escape periodically to admonish the living about some still unfinished business. Like the monster in horror fiction, ghosts represent the return of the repressed. Both Banquo's ghost and Hamlet's father represent an unrighted wrong. Like the monster in horror fiction, ghosts represent the return of the repressed. Both Banquo's ghost and Hamlet's father represent an unrighted wrong. They are an indication that an event in the past has failed to achieve closure. As a result of repression, usually caused by guilt, the ghost frequently re-presents itself at moments usually associated in some way with an anniversary of the event that needs to be repressed. To give a typical example, women who have abortions generally relive the guilt and anguish associated with the death of their child on the anniversary date of either the abortion itself or on the day the woman has calculated as the child's birth date. The aborted child rises ghost-like on the anniversary of his death and accuses the mother in much the same way that Banquo's ghost accuses Macbeth and the ghost of Hamlet's father reproaches Hamlet. Reduced to its simplest form, Medjugorje was this: two girls saw something one hill away from the place where the Surmanci massacres took place on the fortieth anniversary of the massacres, at a time when Tito had been dead for a little over a year and all of eastern Europe was aflame with the nationalism that the Polish labor union Solidarity had inspired in the subject nations of the Soviet empire. Father Zovko tried to deflect attention from Surmanci, claiming that it was absurd "to offload on Medjugorje all the guilt for wartime atrocities that even we older ones hadn't heard of; and as for the children, they weren't even born," but the Serbs remained unconvinced. Belgrade papers satirized an Ustase terrorist Madonna with a large knife between her teeth and a caption proclaiming, "The True Face of the Blessed Mother." In Medjugorje, the "anniversary reaction" was collective as well as personal, and collective in a way that involved the Serbs. Hence, the coincidence of dates. Our Lady of Medjugorje appeared at virtually the same time that the Serbs erected the plaque commemorating the atrocity at Surmanci at the orthodox monastery at Zitomislic, and both of those events occurred forty years to the day after the massacre itself. Ghosts always represent an unrighted wrong. The recognition of the wrong is triggered by some related event, like an anniversary, or the dislocation of the established order. In 1980 the sense that the established order was coming to an end in eastern Europe was in the air. In order to maintain order in an ethnically diverse country riven by atrocities during World War II, the Communists literally fashioned a lid out of concrete and placed it over the opening where the genocide of the Serbs had taken place at Surmanci. If repression can be represented by a lid placed over unwelcome memories and the emotions they generate, then the death of Tito and the election of a Polish pope and the rise of Solidarity meant that the communist lid was about to be removed from Yugoslavia, and the first thing that rose into consciousness in Herzegovina, after the communist repression was removed, was the guilt over what the Herzegovinians had done during the war. In 1989, as a hint of the nationalism that was to follow, the Serbs literally removed the lid and took their dead home. But as in horror movies, so in real life. The guilt is re-presented in a form that is less threatening. Instead of a monster representing the Enlightenment gone wrong, the Herzegovisti were confronted by a warning Mother, a figure of radical ambivalence in which consolation is always a thin veneer over catastrophe, which will follow if her instructions are not carried out. What the children saw, of course, became irrelevant by the third day of the apparitions when the Franciscans, specifically Jozo Zovko, became involved and turned the seers into foot soldiers in their war against Bishop Zanic. The deal with the children was cut as payment for not denouncing them as a hoax and exposing them thereby to the ire of an local population that wanted to believe that their deliverance was just around the corner. Vox populi, vox dei applies here in an uncanny way. It is the people who make a phoney apparition, not God or the Blessed Virgin. They fashion it into the idol of their desires, and so it is not surprising that Medjugojre should take on a nationalistic cast at this place and time. The Virgin was simultaneously the ghost of Croatian sin and the sign of Croatian nationalist hope that the old order was ending, and because the fall of communism seemed like a possibility in the summer of 1981, the Virgin was conjured up by an oppressed Croatian nation to bring it about. The times were propitious. Tito died in 1980; all of Eastern Europe was in turmoil caused by picture of Solidarity workers kneeling in front of the Gdansk shipyard praying the Rosary to the Black Madonna. If the Madonna could save the Poles who prayed to her at Czestochowa, why couldn't the Gospa save the Croatians who prayed to her at Medjugorje. The struggle in Prussia between state and church, known as the Kulturkampf, had already heightened denominational tensions and created fear among a substantial proportion of the Catholic minority; and by 1876 the economic recession that had begun three years earlier was causing serious distress and prompting calls for remedial measures. It was in order to gather bilberries-Waelen in local dialect-that, on the hot Monday of 3 July, a number of young girls found themselves in the Haertelwald, a hilly wooded area that contained many rocky gullies and lay a few minutes away from Marpingen to the south-east....Within less than a week thousands of pilgrims were streaming to Marpingen. Reports spoke of 20,000 in the village, with up to 4,000 at the apparition site singing, praying, and taking away foliage or handfuls of earth from the spot....the civil authorities closed off the area, the three visionaries began to claim apparitions in the school, in the graveyard and the church.... Marpingen became a cause celebre. Journalists, priests, and the sellers of pious memorabilia descended on the village, as well as pilgrims from Germany and abroad. Supporters and opponents of events there dubbed Marpingen ëthe German Lourdes,' even ëthe Bethlehem of Germany.'... There is no doubt that modern apparitions were commonly triggered by larger events: periods of wartime or post-war stress, political conflict, socio-economic crisis. It is also plain that many apparitions had an impact in turn on contemporary political conflicts, above all in helping to foster Catholic identity against the claims of the state or the challenge of anticlericals. Blackbourn feels "there is overwhelming evidence... of the link between the apparitions and a combination of political persecution, material distress, and social change. That is true not only of the original events in Marpingen, but of the revitalized apparition movement in the twentieth century" (pp. xxi-xxvii). Bosnia Herzegovina, it should be remembered, is the ultimate borderland for Europe. It marked the border between the East and West in the Roman Empire, between the Catholic and Orthodox lands of the Middle Ages, between the Austrian and Ottoman empires, and until most recently the western most rim of communism's confrontation with the West, in the twentieth century's version of the schism between east and west. The children who began both Marpingen and Medjugorje had been influenced by Lourdes, Mirjana reading a book on it in the period between June 6 and June 21, 1981. The children represented an oppressed Catholic population looking for release from Prussian Protestantism or Communism respectively. Unable to achieve relief by either political or intellectual means or by force of arms, the oppressed population turned to popular Marian piety as an expression of protest. In both instances, it was the expectation and suppressed aspiration of an oppressed Catholic people, given leadership by the local priest, which brought the crowds and became the driving force behind the apparition. The priest became as well the mediator of the intense psychological pressure that would come to bear on the children as the crowds increased in size and expectation. In exchange for protection from exposure, the children became the pawns of the priests, who, especially in the case of Medjugorje, used them for their own political ends, first as a weapon against the local bishop, and secondly and increasingly as a weapon against the Communists as the tide of nationalism rose to fill the vacuum created by an ideology no one believed in anymore. Reading the interview with Mirjana, it is evident that she hears voices. Mirjana is quite frank in her conduct and about her interior disposition; at one time or another, she has suffered "terribly depressive moods," she has behaved so strangely at school in Sarajevo that her peers considered her crazy. She is seized by sudden onsets of tears, as well as by "unexpected laughter"; she "cries for no reason," she "is too sensitive," etc. When the visions began, Father Zovko asked Mirjana if she were exhausted. She replied: "I would like just to sleep." Like Vicka, she complained only once of a "fit of tears." But she had these "crying fits" from the very beginning of the visions. It seems that she liked to cry. I have the impression that she is vulnerable. ...who pray a lot to God but nobody here on earth prays for them. There are other souls in Purgatory who do not pray at all, but some people on earth pray for them. These prayers are not applied to those souls in Purgatory for whom the prayers are offered but rather to those who pray. For the souls [in Purgatory] who pray a great deal, God allows them to communicate with their people here [on earth]. There was a woman whose two daughters were killed and they appeared to their mother in a dream and petitioned her to pray for them. . . . .I then asked the Gospa what that meant, and she replied that they are in Purgatory and are in need of a little hope to get them into Heaven: they begged their mother to pray for them while they prayed for themselves. There was another woman who lived in a house and something kept constantly knocking on her window. Later on, this very same woman got an apartment way up on the sixth floor and again something kept tapping on her window. I questioned the Gospa about what it was. She replied that the souls in Purgatory were doing so because she has forgotten to pray for them, and they are demanding her prayers. There is no simple Sherlock Holmes explanation of the entities who come and tap on Mirjana's window. This mystery is not going to be solved by the Enlightenment's detectives or its scientists but only by someone who can understand the psychological and religious needs of the people who collaborated on establishing the meaning of the event. Mirjana may very well have divined in some mediumistic way the psychic forces driving the region, and then, as if shocked by what she uncovered, she tried to get out from underneath the burden by progressively involving more people as collaborators. First she involved the other kids, then Marinko, then Zovko and the Franciscans and then the Croatian people and then Catholics from abroad and finally the forces trying to destabilize communism. The best metaphor is more predatory than that. There was no conspiracy here - at least not at the beginning, not until the Franciscans took it over, and even after that it was always a case of big fish eating little fish. As soon as any one person could assemble a certain number of people in one place who were willing to throw x amoung of D-marks into a hole, that person was a candidate to be eaten by someone more powerful than he. Once the crowds became significant enough in size, Zovko was motivated to take it over from Marinko, and the same process has been happening ever since. Big fish eat little fish; they open their mouths and bite ëem; little fish eat littler fish and so on ad infinitum. Mirjana was always characterized as the most "sensitive" of the seers. She cries a lot. The village children refer to her as a "Pankerica," a punk from the big city who is suspected of dealing in drugs. Mirjana read a book on Lourdes at sometime in early June and then reflecting on her situation as part of a persecuted Catholic minority in a borderland area neglected by the regime because of its Catholicism, which was linked inalterably in the regime's mind with the atrocity committed against the Serbs, Mirjana has a vision and her people are energized by the local instantiation of events that seem to be moving the entire world. One month after an attempt was made on the life of the pope, the Virgin comes to offer consolation and warning. As one woman who heard about the apparition within a matter of days while watching TV in Split put it, "it had to be true." Even granting the authority and the solace and protection that the priests offered, the psychological pressure on the seers was enormous, and given the fact that she orchestrated it at the beginning, it is perhaps not surprising that Mirjana Dragicevic would be the first to crack under the pressure. On Christmas day 1982, 18 months to the day from the first apparition, Mirjana announced that the apparitions had stopped. Before departing, however, the Blessed Virgin gave Mirjana ten secrets, which would be revealed to the world after three warnings, in the form of three dire events, which would take place just before the visible sign would appear from heaven. Once the great sign appeared, if the world did not turn to God, it would suffer a terrible punishment. "As for the tenth [secret]," Mirjana warned the world, " it is terrible, and nothing can alter it. It will happen." "Marko [Soldo]," he explained, "chased away Mirjana's boyfriend and married her. He then built a house, got into financial trouble, and needed cash so she started to have apparitions again. Now he's selling diesel cars from Italy. He's on the radio in Croatia, with radio ads selling used cars." As of June of 1997, it looks as if Mirjana is planning to weather the chastisement, - now a bit long in coming - in style. Mirjana now lives in a German mansion right across the street from Ivan's German mansion. Both buildings would hold their own in a well-to-do suburb of Karlsruhe or Stuttgart, which came to symbolize the promised land for Mirjana's generation whose fathers were often away from home laboring as Gastarbeiter in the Bundesrepublik. Both houses have lawns, which require frequent watering, something in short supply in a place like Medjugorje. Phil Kronzer probably noticed none of this as the two of us walked up to Mirjana's front door. He knew that he had a nice house in Los Gatos once, but he had lost it as a result of his divorce settlement. He had an even nicer house in Carmel, the beautiful town on the California coast just South of Monterey, but he would lose that house too before the year was out. Mirjana and her husband Marko Soldo had stayed in that house on one of their appearances at one of the numerous west coast Marian conferences and had even told Phil that their second child had been conceived there. Phil's plan was simple. Phil wanted his wife back, and he wanted Mirjana's help in getting her back. His reasoning seemed plausible enough. If Ardie left him because of Medjugorje, what better way to get her back than have one of the Medjugorje seers arrange it. Mirjana could even say that she had talked it over with the Blessed Mother, a statement no less plausible than the ten secrets, which the average Medjugorje enthusiast had no trouble believing. When we get to Mirjana's door, we are greeted - albeit a bit warily - by a group of middle-aged female pilgrims from California, who tell us that Mirjana is not at home. She is involved in the festivities surrounding the 16th anniversary. "Come back later," Phil is told, and it is only after we have turned away that he mentions that it was a tour guide from California who turned him away. If he recognized her, Phil reasons, then she most probably recognized him. As we walk away from Mirjana's house, I realize that for the first time during my stay in Medjugorje that the parties most financially interested in preserving the apparitions will know my exact whereabouts. The thought does not cheer me. I remember the expression on Slavko Barbaric's face as we passed each other at the base of Mr. Krisovac. If looks could kill, I would have been dead. So now they know where we are going to be and when, I thought. The thought did not cheer me. E. Michael Jones is the editor of Culture Wars and the author of nine books, including Medjugorje: The Untold Story, available from Fidelity Press. "The Ghosts of Surmanci" is excerpted from a book of the same name on the apparitions of Medjugorje and the subsequent civil war that destroyed Yugoslavia.